Thanks for your interest – this call out is now ended, as we have all the participants we need for this round. Please get in touch with Corrina via her contact page if you are interested in being a part of a future show or project. 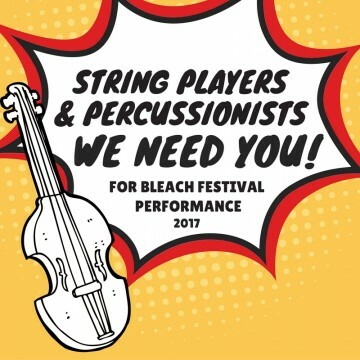 String players and percussionists – I need you for an exciting outdoor performance on April 2, 2017 as part of Bleach* Festival. Bleach is the signature annual multi-arts festival of the Gold Coast. It celebrates the city’s best artists, features renowned Australian and international collaborators, and engages a broad audience through a range of accessible events that use the Gold Coast’s world famous natural landscapes as unconventional venues. String players and percussionists (high-level amateur, community group performers and professionals) are invited to participate in a program of workshops/rehearsals culminating in the public performance of Song to the Earth, a 20-minute partly-score composition by Corrina Bonshek, that includes nature sounds. think birds are pretty awesome musicians. Your music performance will be a part of a community engaged event involving dance, music, art installation, called Inherit the Wind, which celebrates our interconnectedness with the planet earth, and takes place outside at dusk in Queen Elizabeth Park, Coolangatta in April 2017. View a video with highlights from the pilot performance of Inherit the Wind at Bleach* Festival 2015. To get an idea of what this might be like, take a look at Sila and Inuksuit, two large-scale outdoor works by Pulitzer Prize-winning USA composer John Luther Adams. Applications are due 1 December. Download and complete the form below. Scan or take a photo and email back (contact details on the form).